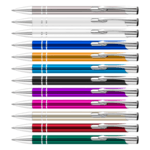 Promotional pens and printed pencils supplied branded with your logo imprint or as plain stock items for use in any type of advertising campaign or as giveaways to promote your organisation. 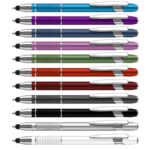 For more details click on the individual pen collections to see further details, personalisation options and pricing. Prices include branding with your imprint and logo. 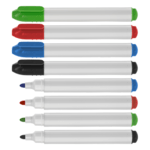 Promotional pens marked “POA” are priced on application. 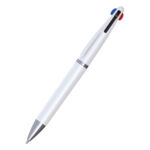 Promotional Pens are one of the most widely distributed promotional giveaways. The vast range available offers many options for personalisation in terms of colours, imprint areas and mechanical form. 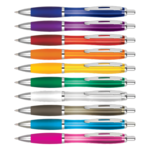 No matter what the industry, promotional pens are always seen as a worthwhile marketing investment. They offer a great way to promote a brand name, website address and contact details and can be used at trade shows, exhibitions, conferences and sales visits, as well as with direct mail promotions, literature packs and as general office items. 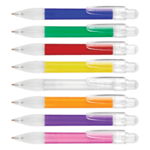 Our most popular promotional pens are the plastic and frosted plastic pens. Some of these are available on an express delivery. ECO environmentally friendly pen alternatives are available. These can be made from recycled plastics, papers, clothing, money and plant materials. The wooden versions tend to be made from wood farmed from sustainably managed forests. Typical order quantities for pens run from 100-250 pieces. Given the low unit cost of some plastic pens this represents a small investment for most companies. The unit costs are low for this popular type of promotional giveaway. Pricing is off course quantity dependent and metal and leading brand pens (Parker Pens) tend to carry a premium. Most pens are available within ten working days. Express delivery pens are generally available within three to five working days and we have some on 24hour delivery. Plain stock pens are available on application and can be personalised by our clients. 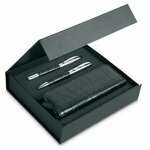 Pen sets present a more premium image for a product that is essentially seen as a giveaway. 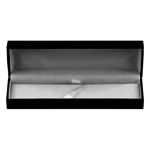 These can be packaged into presentation boxes and pen pouches to protect them. 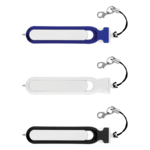 For such products the branding areas are small and are limited to the length of the pen barrel, and sometimes additionally the pen clips. Attention needs to be given as to what to print on the pen barrel and clips. Often clients will put a phone number or short website address on the clip, with their logo and main contact details on the barrel. This choice is very much dependent upon the length of the company name and website address. The most common branding technique is screen printing and a one colour print can have a high impact on a contrasting barrel colour. Promotional pens can be branded in more than one position and for some pens we offer a complete 360 degree wrap around print. Metal pens can be laser engraved. There are so many different branded pens and options available but sometimes you cannot find exactly what you need for your campaign or you or your client simply want to consider a bespoke pen. There are two choices here. The first is to give us a complete brief of what you want from your pen and we can then search through our supply chain to find more pens that could more closely match your brief. This an extensive sourcing task but one we have completed for other clients. 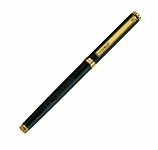 The second alternative can cost more unless the manufacturing and print run is exceptionally large and that is to consider a bespoke pen project. For this we need a brief and we can then provide you with a cost and timescales. What pen brands do you offer? We offer a variety of brands at Redbows including BIC Pens, Pierre Cardin Pens, Parker Pens, Prodir Pens, Senator Pens and Sheaffer Pens. Each offers their own individual styles and designs with various packaging options and branding techniques. For more information please contact us. 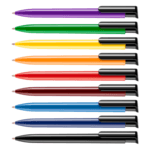 What are the delivery options on pens and pencils? 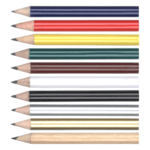 Most pens and pencils are available within ten working days. However express delivery is generally available within three to five working days. For those with no time to spare we can provide pens within 48hrs from artwork approval. What are the print areas on a pen? Almost all pens offer the barrel as the primary print area and clients can often choose to print on one side of the pen or both. 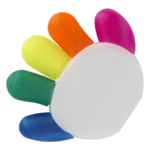 Where we can offer a digital print it may be possible to print on the entire barrel as a 360degree print. The other print area is the pen clip itself. Remember that print areas are small on pens so don’t try to cram in as much information as possible into a single imprint area.